Experts In Genealogy: Genealogy Blog Party Theme for April 2016: Time Travel to an Ancestor! Genealogy Blog Party Theme for April 2016: Time Travel to an Ancestor! I've never viewed "Doctor Who"...but how could I knock back the invitation...I'm excited to join this party. I would love to catch up with George TELLESSON an illiterate Norwegian Merchant Mariner who was born in Norway in 1837. He is the 2xGGrandfather of my partner. What are the names of your parents? Do you have a brother by the name of Thomas? Where were you in the 1851 & 1861 UK Census? Now...for the curious...why have I asked those questions??? I'm not 100% certain of who George's parents are. The names given in his marriage certificate on his second marriage have given me some clues, but it is not the definitive answer. 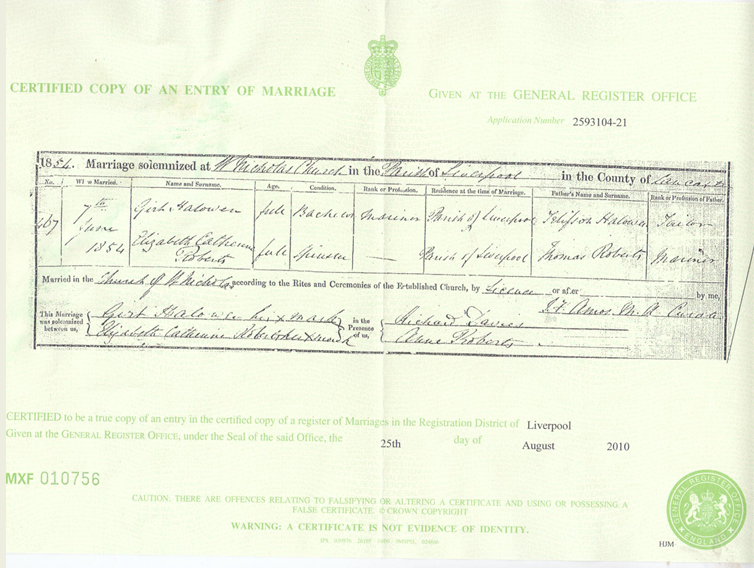 On the first marriage certificate, there is further information given re George's father's details. (Note: it was many, many years until I confirmed that this was my George Tellesson...) the name given was obviously written down by the priest who married George and Elizabeth. In regards to the question of whether or not he had a brother called Thomas - George's first son named George Robert Australia TELLESSON. Thomas TELLESSON is believed to have come to Australia prior to the birth of George Robert Australia TELLESSON. Note: the 'Australia' part of his name has never been noted in any further documents. I have found a Thomas TELLESON who appears in the records of marriages, births and deaths. His children have similar names to that of George's too and had followed similar careers to that of George's children and grand children. Looking forward to seeing if there are any of Thomas's descendants out there. Thank you to Elizabeth O'Neal, for hosting this awesome party. Sharing the passion of Genealogy & Family History. Great idea to take photos! I'm sure I would have my camera along (since it goes everywhere with me) but I'm not so sure I would remember to pull it out! I hope you have success finding information and sources to find/clarify George's parents and brother.